We were approached by international consulting firm, Indevelop, to aid in the development of a National Education Strategic Plan for the Government of Myanmar. 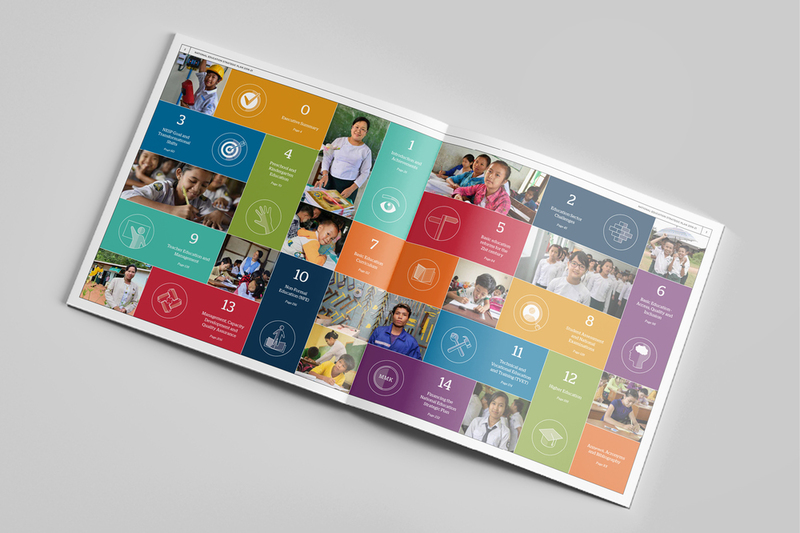 The project involved the design of two high-level documents – a 300-page report and a smaller 60 page summary report – that outline key strategies to reform Myanmar's education system, from preschool through to tertiary education and beyond. Our role in this project was to take the information and present it in a visually appealing way without it seeming too wordy or overly designed. Where possible, we added custom infographics to break the text into easily readable chunks, and used beautiful photography and colour coding to guide the reader and separate content. Another major consideration was the fact that both documents would be produced in English and Burmese, meaning that our design had to be flexible enough to allow both languages to be easily read and understood. The final product is an elegant over-sized square book that manages to tread the line between form and function. Content is logically laid out, with aesthetic appeal provided by our bespoke illustrations, photography and diagrams.